Treat coloured hair to the TIGI Bed Head Colour Goddess Gift Pack; an oil-infused shampoo, conditioner and hair mask that work in tandem to restore and revitalise lack-lustre locks. Expect cleansed, conditioned and hydrated hair with enhanced luminosity. Enriched with Pro-Vitamin B5, Sweet Almond Oil and Keratin, the gentle shampoo effortlessly eliminates product residue and impurities, whilst maintaining strong, radiant and healthy-looking locks. Hair is brighter and cleaner with restored vibrancy. Maintain colour after washing with the lightweight conditioner; developed to enhance shine and preserve colour-treated hair, leaving it radiant and healthy-looking from root to tip. Experience nourished, hydrated locks with a smooth, sleek and glossy finish. 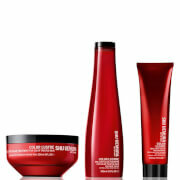 A weekly treatment that works to revitalise and rejuvenate lack-lustre locks. Penetrating deeply into hair fibres, the radiance-reviving formula combats dullness to leave hair looking smooth, sleek and vibrant every time. Shampoo: Water (Aqua/Eau), Sodium Laureth Sulfate, Cocamidopropyl Betaine, Glycerin, Potassium Chloride, Fragrance (Parfum), Butyrospermum Parkii (Shea) Butter, Prunus Amygdalus Dulcis (Sweet Almond) Oil, Cocos Nucifera (Coconut) Oil, Glycine Soja (Soybean) Oil, Hydrolyzed Keratin, Glycol Distearate, Dimethiconol, Phenoxyethanol, Carbomer, Sodium Chloride, Amodimethicone, Guar Hydroxypropyltrimonium Chloride, Tea-dodecylbenzenesulfonate, Laureth-23, Disodium Edta, Trideceth-12, Sodium Benzoate, Peg-45m, Magnesium Nitrate, Benzophenone-4, Citric Acid, Cetrimonium Chloride, Panthenol, Ppg-9, Tocopheryl Acetate, Silica, Methylchloroisothiazolinone, Magnesium Chloride, Methylisothiazolinone, Blue 1 (Ci 42090), Red 33 (Ci 17200), Yellow 5 (Ci 19140), Iron Oxides (Ci 77491), Mica (Ci 77019), Titanium Dioxide (Ci 77891). Conditioner: Water (Aqua/Eau), Cetearyl Alcohol, Dimethicone, Glycerin, Mineral Oil (Paraffinum Liquidum/ Huile Minérale), Stearamidopropyl Dimethylamine, Fragrance (Parfum), Behentrimonium Chloride, Hydroxyethylcellulose, Phenoxyethanol, Dipropylene Glycol, Lactic Acid, Polyurethane-39, Amodimethicone, Guar Hydroxypropyltrimonium Chloride, Potassium Chloride, Peg-45m, Disodium Edta, Cetrimonium Chloride, Peg-7 Propylheptyl Ether, Magnesium Nitrate, Cocos Nucifera (Coconut) Oil, Glycine Soja (Soybean) Oil, Panthenol, Silica, Hydrolyzed Keratin, Benzoic Acid, Prunus Amygdalus Dulcis (Sweet Almond) Oil, Tocopheryl Acetate, Dehydroacetic Acid, Ethylchloroisothiazolinone, Butyrospermum Parkii (Shea) Butter, Magnesium Chloride, Methylisothiazolinone, Ethylhexylglycerin, Citric Acid, Potassium Sorbate, Bht, Blue 1 (Ci 42090), Red 33 (Ci 17200), Yellow 5 (Ci 19140), Yellow 6 (Ci 15985). Mask: Water (Aqua/Eau), Cetearyl Alcohol, Cetyl Palmitate, Behentrimonium Chloride, Glycerin, Dipropylene Glycol, Dimethicone, Fragrance (Parfum), Phenoxyethanol, Amodimethicone, Disodium Edta, Cetrimonium Chloride, Peg-7 Propylheptyl Ether, Magnesium Nitrate, Cocos Nucifera (Coconut) Oil, Glycine Soja (Soybean) Oil, Panthenol, Hydrolyzed Keratin, Prunus Amygdalus Dulcis (Sweet Almond) Oil, Tocopheryl Acetate, Methylchloroisothiazolinone, Butyrospermum Parkii (Shea) Butter, Magnesium Chloride, Methylisothiazolinone, Citric Acid, Potassium Sorbate, Bht, Coumarin, Red 33 (Ci 17200), Blue 1 (Ci 42090), Yellow 5 (Ci 19140), Yellow 6 (Ci 15985). Axei uma boa prenda e comprei este pack para oferecer à minha mãe. Ela gosta particularmente da máscara que deixa o cabelo bastante suave e fácil de pentear.